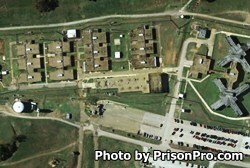 Skyview Unit is a psychiatric facility for inmates located in Rusk Texas, part of Cherokee County. Skyview Unit houses both males and females and has a maximum capacity of 562 inmates. Generally, offenders will be sent to Skyview Unit if they have or exhibit signs of mental illness. Inmates who are transferred to Skyview Unit from other institutions will initially be placed into "crisis management." Crisis management inmates are separate from the general population of Skyview, and many who have been through crisis management report their stay as difficult due to the fact that they are alone in a cell with only a blanket for a week or more. Inmates who are placed into a program at Skyview, or who are housed in Skyview's general population have reported this as being one of the best institutions in Texas to be housed in as it has air conditioning, daily counseling, and pleasant staff. Inmates at Skyview Unit are provided with inpatient mental health treatment. Substance abuse education and various support groups, including group therapy sessions are available to offenders. Skyview Unit provides a family visitation center, and operates a facility garden. Academic educational programs are limited to availability, as most inmates are not held at the facility for a long enough duration to participate in educational programs. Inmates who are incarcerated at the Skyview Unit in Texas have visitation hours from 8am to 5pm on Saturdays and Sundays. Offenders are allowed a single visit each weekend that may be up to two hours in duration. All visits, regardless of entry time will end promptly at 5pm. Always call before you visit to verify your inmate is eligible for visits and is still housed at Skyview Unit.